The Postal Inspection Service needs your help to protect customers from crimes involving the U.S. Mail. 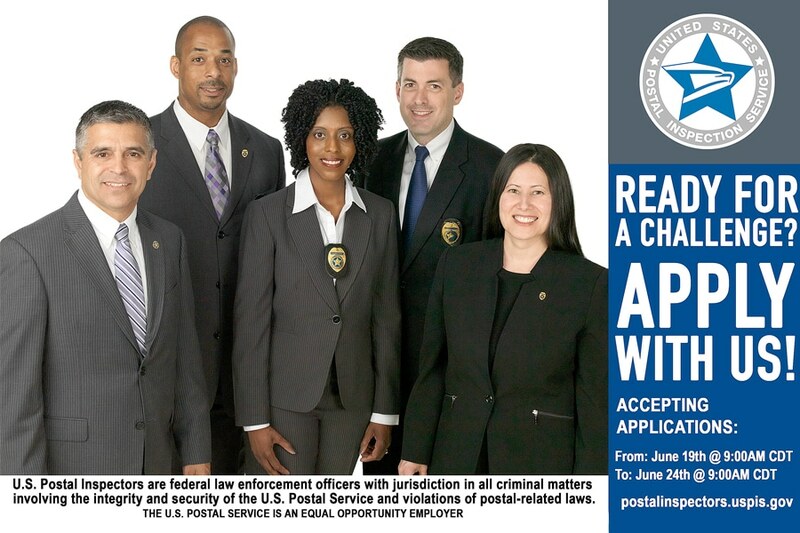 If you’re up for the challenge, apply to become a postal inspector from Monday, June 19, at 9 a.m. CDT through Saturday, June 24, at 9 a.m. CDT. Inspectors are federal law enforcement agents with investigative jurisdiction in all criminal matters involving the integrity and security of the Postal Service. Inspectors investigate criminal, civil and administrative violations of postal-related laws, often using forensics and cutting-edge technologies. The Inspection Service Online Application page has information on the applicant screening process and how to apply. Before applying, applicants should read the general eligibility requirements on the online Employment Eligibility page. This entry was posted in General Union Business, Transfers/Vacancies and tagged federal law enforcement agents, jobs, postal inspection service, USPIS. Bookmark the permalink.